After the tremendous success of iShoot, iPhone App developers seem to have been working round-the-clock in providing Lite versions of their games in hopes to reproduce some of Ethan Nicholas’ success. 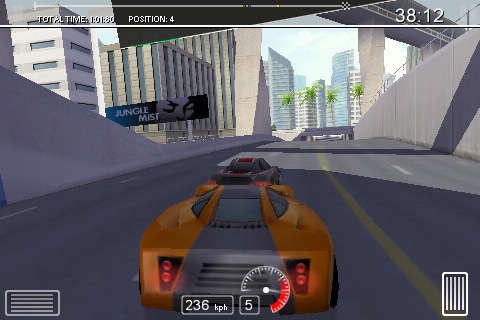 Fastlane Street Racing developers Atod AB seems to be another major Lite success story with the release of their Fastlane Street Racing Lite [App Store] game just one week ago. The Lite version of the game contains only one car, but that’s apparently enough. The Lite version hit the Top 100 Free games 4 days ago and quickly rocketed up to the #1 spot. The full $4.99 version followed just one day later and has risen from off the Top 100 Paid chart to #86, #45, and now #21 at the time of this writing. We couldn’t be happier for the developers who are regular participants in our forums. We reviewed the game and found it to be the “best looking, best playing racing game" in the App Store at the time. We even included it in our Top 2008 games list. Here’s your chance to try it.